We just wanted to give up a quick update on two new features which were recently introduced on Toluna.com along with some additional performance enhancements and general improvements. 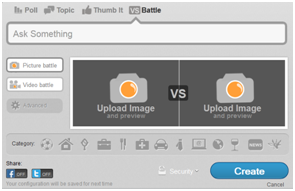 With a Battle you can upload two images or two videos and let the community decide which one they prefer. 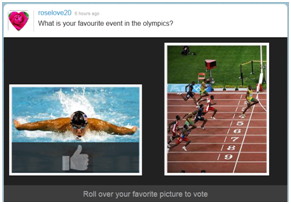 So if you’re deciding between two different desserts to bring to the party, want to know which shoes look really cool or just want to see if the community prefers Usain Bolt or Ryan Lochte (to keep the Olympic theme going) this is the perfect tool for you! 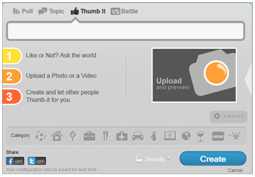 With a Thumb it, we get a similar story, but this time you upload a photo or video and find out what the community thinks directly. 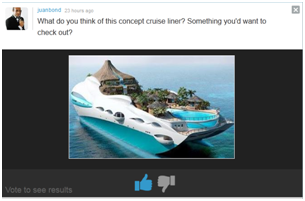 They’ll give whatever it is a quick thumbs up or down vote depending on whether they like or dislike the topic – we could be discussing a famous restaurant or travel destination, world leader, or that quirky new dress you just saw but aren’t quite sure whether to buy – and you’ll get answers to your question right away. Both of these features have been available on our mobile app for some time now (don’t hesitate to check them it out here: iPhone/iPad and Android) and they were such a success on the apps that we decided to roll them out to the website. We hope you enjoy these new features and we look forward to bringing you more in the near future.